I am living in Ottawa and I use TRI-ACTA H.A. for my two Golden Retrievers. 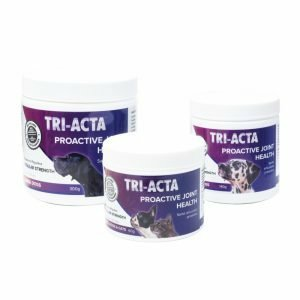 Since I have been using TRI-ACTA H.A. (instead of paying $300 a month on pills from my vet that were not working) I have found an amazing change in my 13 year old boy with elbow dysplasia and arthritis. He is starting to play with my other dogs and clearly does not have the pain in his joints like before. This is a miracle powder. I have recently started using your amazing product for my beloved 12 year old German Shepherd, whom we had almost lost all hope for. It was recommended by Amanda from Ren’s Pet Supplies in Oakville and in all honesty I was reluctant to try it. I am totally amazed by the results and how much it has improved her quality of life. She is now able to go for short walks and is able to once again claim her rightful place on our family room couch. I cannot thank you enough for making such a miraculous product and giving my beautiful Taylor what I hope will be many remaining years of comfort. I have a 6 year old Australian Cattle Dog who was diagnosed with advanced Spondylosis about 6 months ago. She was in a lot of pain when standing up from sleeping or after any activity. She was unable to jump on to her favourite sleeping spot (my bed). Normally a very good natured dog, I noticed that she was keeping more to herself and looking very strained and tired. I tried your TRI-ACTA on the recommendation of a friend and the results have been remarkable. She has not limped or whimpered for 5 months and her temperament is back to being interactive, bossy and good natured and also back to sleeping in her favourite spot. I was not expecting much but was prepared to try anything before having to resort to pain killers. We were incredibly lucky to stumble across your product right away. Amazing, amazing stuff. Thank you for the years of helping us to provide the best we can for proper development of some of Canada’s top Obedience dogs. Hundreds of people we have referred to you also agree with our prognosis of the changes this product can make to our beloved dogs. We are pleased to say that over the past 12 years we have received many OFA excellence and goods because of your help. Looking to learn more about helping to maintain your pet's health? Our team of experts has gathered a number of helpful resources to get you started.